Where can I find OneAgent logs? Where can I view virtualization monitoring data? How does virtual machine migration affect performance? How do I monitor Heroku applications? Which network ports does Dynatrace Server use? Can I use a proxy for internet access? How does Mission Control pro-active support work? When do I need to install an ActiveGate? Where can I find ActiveGate files? Which network ports does ActiveGate use? Create custom names for user actions? Import custom locations from a CSV file? Configure XHR for older versions of IE? Why don&apos;t I see my applications or monitoring data? What does a &apos;Max. user actions per minute exceeded&apos; event mean? What data is included in Real User Monitoring? How do third-party services affect performance? How are Visually complete and speed index metrics calculated? What are key performance metrics? Where can I find crash reports for a mobile app? Where can I monitor my services? Which are the most important processes? What technologies underlie individual processes? How effective is infrastructure monitoring on its own? Where can I view host performance measures? What insights can log analytics provide? What log format does Log Analytics support? How are new problems evaluated and raised? What is a monitoring environment? What is an access token? Why do I need an environment ID? Can I set up multiple monitoring environments? Dynatrace failure detection automatically detects the vast majority of error conditions in your environment, including the underlying root causes. With this approach, Dynatrace is able to provide you with answers when problems occur or when your application performance drops. A detected service error doesn&apos;t necessarily mean that a request has failed. There may be cases where the default service-error detection settings don&apos;t meet your particular needs. In such cases, you can configure these settings as explained in this topic. Programming exceptions (Java, .NET, Node.js, and PHP) as the reason for failed requests when exceptions result in the abort of service calls. Error pages provided by many web containers for handled exceptions. HTTP 500-599 error codes for web requests are interpreted as errors on the server side. HTTP 400-599 error codes for web requests are interpreted as errors on the client side. Select Transactions & services from the navigation menu. Select the service for which you need to adapt failure detection. Click the browse button (…) and select Edit. Select the Error detection tab. From the settings provided (see the following sections), adapt those appropriate for your needs. For further details regarding the supported service error detection settings, see the options below. You can however explicitly specify which missing HTTP response codes should be treated as server side errors and which as client side errors. A missing response code is a special case here. In some situations this simply indicates a "fire and forget" call that didn&apos;t return a response at all. In other situations it might indicate a timeout or error situation. This is highly dependent on your application. By default, Dynatrace will assume the former. You can choose the latter as an opt-in. When a web server can’t find a certain page it returns an HTTP 404 response code. Usually, this indicates a problem on the calling side. In cases where the calling side belongs to the same website, this would be considered a broken link. Dynatrace doesn&apos;t detect broken links as service failures automatically as most customers don&apos;t consider this to be a problem in their service. However you can enable broken link detection as an opt-in setting. Moreover, you can consider additional hosts as belonging to your application by enabling Treat broken links as server side errors and adding the name of the host under Add broken link host rule. Some exceptions indicate that the client aborted the operation. Although this is a technical error, in principle doesn&apos;t count as a failed request as it&apos;s not something that is the services fault. 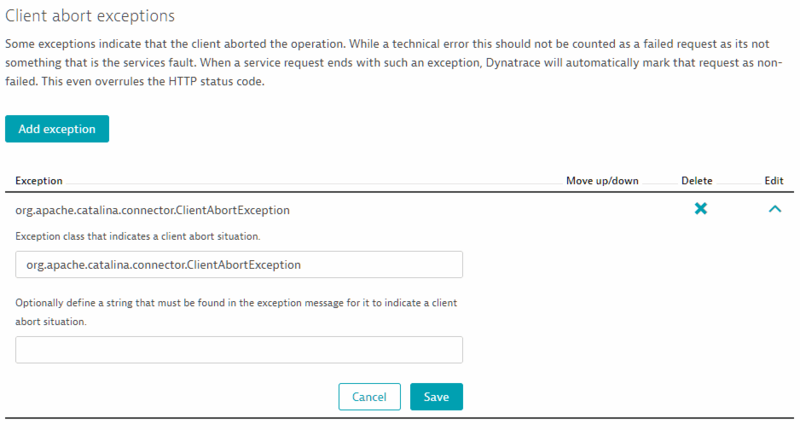 If a service request encounters such an exception, Dynatrace won’t consider the request failed, regardless of the HTTP error code or any other information. Error detection will simply ignore such exceptions. You can add exception classes that indicate such situations. There are cases where your code (or 3rd-party code you have no control over) returns exceptions that indicate a certain response and not an error. Take the Thrift client for Cassandra, for example. It returns a NotFoundException when a row isn’t found. This isn’t an error, but simply a response code. As such, Dynatrace shouldn’t consider such exceptions as failed request indicators. You can configure this, through an explicit setting, as shown below. Additionally, you can define a string that must be found within an exception message for the exception to be ignored. There are situations where application code handles exceptions gracefully in a manner that isn’t automatically detected by Dynatrace. When this happens, Dynatrace doesn’t detect failed requests or alert you to errors. Such situations can easily be remedied by simply specifying any exception class that should result in a failed request. Optionally you can define a string that must be found in the exception message. If this string is not found then the exception will not lead to a failed request. If Dynatrace finds the defined exception (and the optionally-defined exception message) on any request, Dynatrace will mark that request as failed. Note that this will not work if you excluded the exception class from being captured in the Deep monitoring settings. Not all custom error situations are triggered by exceptions. Some error situations are only detectable via a return value or other means. To support such cases, you can define a request attribute that captures the required data. You can then define a custom error rule based on the request attribute that will check the value of the request attribute to decide if the request has failed or not. There are many cases where requests fail for reasons that are related to business logic. While such situations often aren’t detectable via exceptions or HTTP response codes, they are nevertheless indicative of problems. In fact, these situations may be even more important than situations that are detected via exceptions and response codes. To handle these situations, Dynatrace allows you to use request attributes as indicators for error situations. For example, you might have a business function in your Java code that indicates an error via a return value. In other situations, you might have your own error handling functionality that, when called, indicates a functional business error. All of these situations can be captured via request attributes. Within the Custom errors section of the page, click the Add custom error rule button. Select a request attribute from the displayed list (note that not all listed attributes may be available for the respective service). Define a condition for the rule. You can define a simple exists rule or a greater than, or a contains rule. In the example below, a value of -1 in the Amount of recommendations attribute indicates an error. If Dynatrace detects such an error, it will mark the respective service request as failed and explain that the rule match is the reason for the failure.